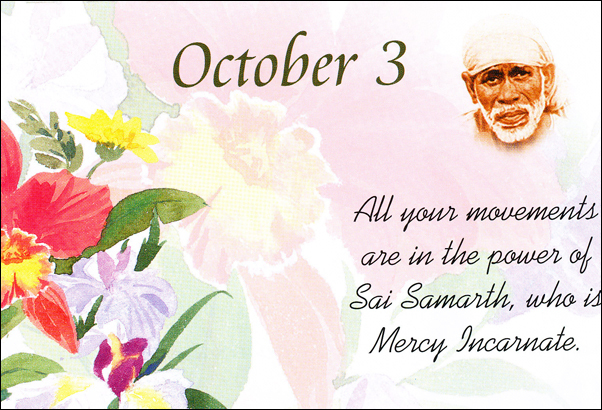 With Sai Baba's immense grace and blessings, i will be presenting teachings from Shirdi Sai Speaks in this post. At the end of the post is download link of all pictures at one go. Picture are zipped in folder. After downloading the folder, 'right click' it and select 'Extract to 10Oct' to unzip all the pictures. 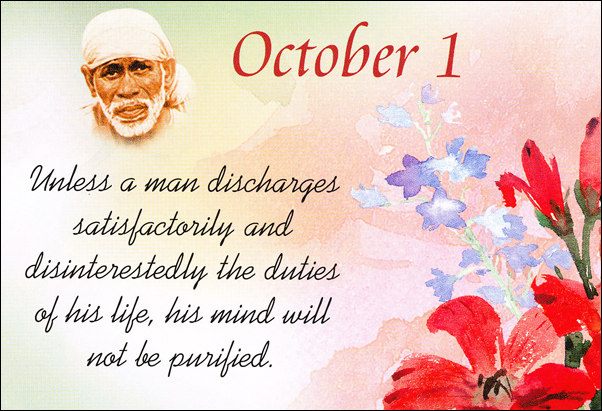 1 Unless a man discharges satisfactorily and disinterestedly the duties of his life, his mind will not be purified. 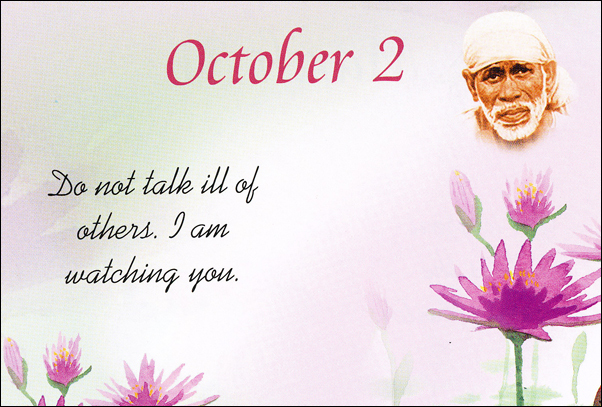 2 Do not talk ill of others. I am watching you. 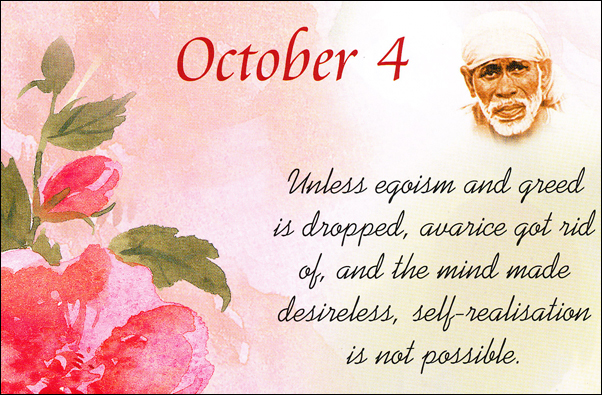 4 Unless egoism and greed is dropped, avarice got rid of, and the mind made desireless, self-realisation is not possible. 5 Smear his vibhuti, and drink it every day with faith. You will have your desires fulfilled. 6 Worship Me always, who is seated in your heart, as well as in the hearts of all beings. 7 When the Lord is pleased with anybody, he gives him viveka and vairagya and takes him safe beyong the ocean of mundane existence. 8 Where there is greed, there is no room for thought or meditation of the Brahma. 9 What is wanted is loving devotion. 10 Wealth and prosperity are transient, and the body is subject to decay and death. 11 We come here (in this world) alone and have to leave alone. 12 Wealth should be the means to work out Dharma. 13 We have to reap now the fruits of what we sow in our past lives, and there is no use in crying out. 14 When the heart is pure, there is no difficulty attaining self-realisation. 15 Why should one be afraid of anyone, if there is no evil thought in him? 16 Why do you grieve for anything? 17 We should be honest, upright and virtuous. 18 We must distinguish right from wrong. 19 What you sow, you reap. What you give, you get. 20 Why are you fearing those who are gone? Be content with those who survive. Fear not. Am I not near you? 21 Whosoever is destined to be struck will be struck, is to die will die, is to be caressed will be caressed. 22 When you undertake anything, carry it out thoroughly, or do not undertake it. 23 What I say, happens. 24 Who is whose? Who gives? Who receives? None will give timely help. Receive it from Me. 25 Whenever any idea of joy or sorrow arises in your mind, resist it. Do not give room to it. It is pure delusion. 26 Without suffering the results of past karmas, you cannot get rid of the body. 27 Why should there be any fear when I am here? 28 Yoga, sacrifice, penance and knowledge are the means to attain God. If you do not succeed in those, vain is your birth. 29 You should not speak rudely to anyone so as to hurt one's feelings. 30 Engage yourself in good thoughts and actions. Do your duties and surrender yourself, heart and soul, to Me. 31 Yoga practices and studying the scriptures are quite useless, if they are not accompanied by Bhakti. Aum Sai. Very useful gems. Thank you.